11/16: Tampa Bay has updated the situation, confirming that Vasilevskiy did indeed suffer a left foot fracture. The Lightning announced that their starting goalie is expected to miss four to six weeks while he recovers. The timeline leaves open the possibility that Vasilevsky could return to the Tampa net by the middle of next month, possibly in time for a divisional clash with the Toronto Maple Leafs on December 13th. However, on the other end of the spectrum, Vasilevskiy may have already played his final game of the 2018 calendar year. 11/15: The Tampa Bay Lightning lost their last game at the hands of the Buffalo Sabres 2-1, but may have suffered a loss even bigger just a few days prior. Darren Dreger of TSN is reporting that goaltender Andrei Vasilevskiy has suffered a broken left foot, while Joe Smith of The Athletic confirms that he’s going in for evaluation later today. The last game Vasilevskiy had played was a 6-4 loss to the Ottawa Senators on the weekend. Louis Domingue will now likely take over the full-time starting duties for the Lightning as they deal with this situation, and Eddie Pasquale has been recalled from the Syracuse Crunch. Vasilevskiy apparently injured the foot at practice while making a save, and has been sent back to Tampa Bay to have further testing done. In the meantime the team has already placed him on injured reserve, meaning they know that he’ll be out for at least a week. If it turns into a long-term issue, the Lightning have to be concerned about their precarious lead over the Toronto Maple Leafs in the Atlantic Division, given Domingue’s lack of experience as a true starter. Since being drafted in 2010, the 26-year old Domingue has just 101 NHL games under his belt and has never played more than 39 in a single season. Even that was several years ago with the Arizona Coyotes, and since Pasquale has still yet to make an appearance at the NHL level the Lightning don’t have a ton of experience in the crease right now. Domingue did perform well after coming over to the Lightning last season and earned himself a two-year extension with the team. 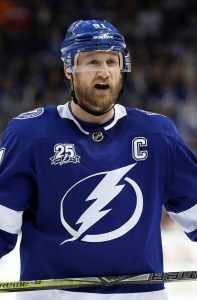 He’ll have to earn every penny of that paycheck now, as the Lightning will have to rely on him for the foreseeable future. The Tampa Bay Lightning have re-signed Louis Domingue to a two-year $2.3MM contract ($1.15MM AAV). Domingue was scheduled to become a restricted free agent, but will now remain with the Lightning and presumably have the inside track to be Andrei Vasilevskiy’s backup given the team’s recent trade of Peter Budaj. Domingue, 26, came over from the Arizona Coyotes in November of last season and made quite the impression on his new team. With a .919 save percentage in 18 games with the Syracuse Crunch, and a .914 in 12 appearances with Tampa Bay, Domingue showed himself to be quite capable to back up Vasilevskiy for the foreseeable future. 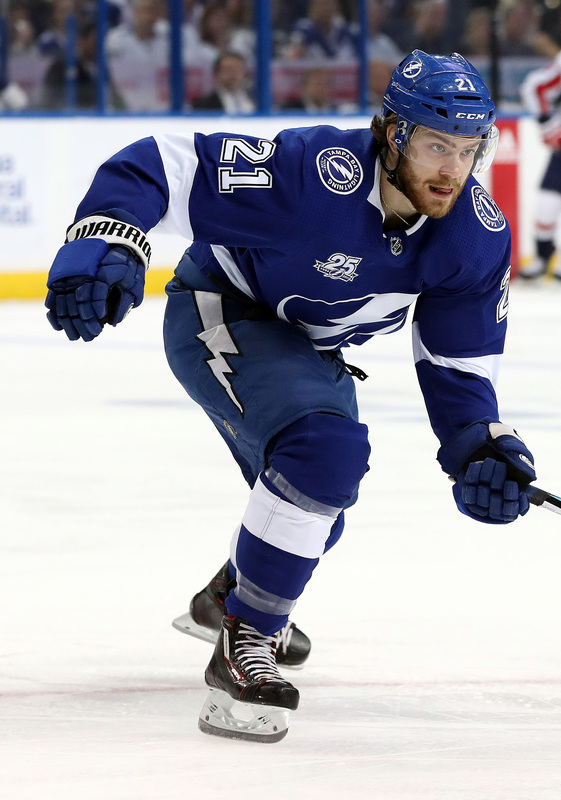 He’ll receive just a slight raise on the two-year $2.1MM contract he signed with the Coyotes in 2016, and remain an almost risk-free proposition for the Lightning. Even if Domingue falters, almost all of his cap hit can be buried in the minors without trouble. If he can provide the same excellent play going forward, he’ll look like one of the better goaltending contracts in the league. 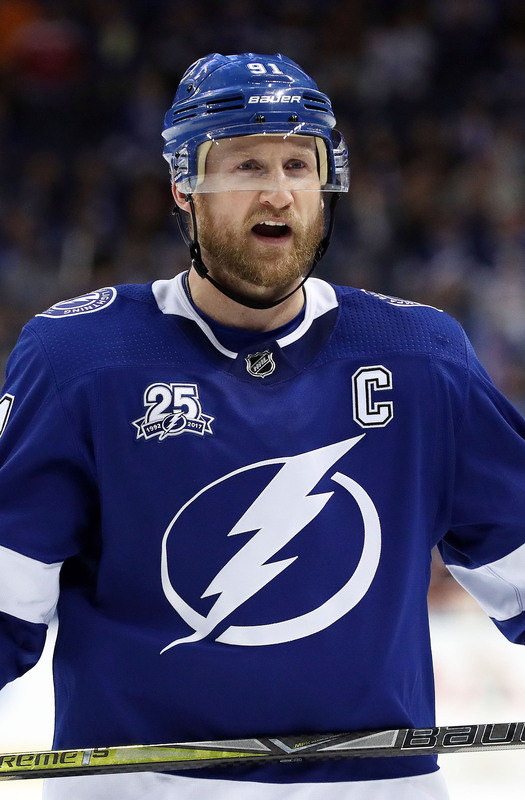 It’s important that the Lightning locked up a suitable back up goaltender, as Vasilevskiy admitted late in the season that he was feeling fatigued from taking over the full-time starting duties. The 23-year old goaltender played in a career-high 65 games last season, a huge number for any netminder. Adding in another 17 playoff starts and there was a clear need to bring in someone who could spell Vasilevskiy for somewhere around 20-25 games, and Domingue will be asked to be that player. The team does have Connor Ingram on his way, but he’ll still need at least a few years of development before he’s ready to jump to the NHL. It might work out perfectly, as Domingue will be an unrestricted free agent at the end of this deal. The Dallas Stars are back to just two goalies, having reassigned Mike McKenna to AHL Texas. McKenna was briefly called up as a precaution, but did not see any action with Dallas. The veteran journeyman has made 29 AHL appearance this season though, posting a 2.64 GAA and .908 save percentage. Despite those pedestrian numbers, he will remain the next man up for the Stars should injury befall Ben Bishop or Kari Lehtonen down the stretch or (potentially) in the postseason. The Columbus Blue Jackets will have recently-extended defenseman Dean Kukan back in the lineup, as the team announced that they have activated him from injured reserve. Kukan had missed the past 12 games with an upper-body injury that landed him on IR back in mid-February. It remains to be seen if Kukan will stay in Columbus or instead see some guaranteed game action with the AHL’s Cleveland Monsters, where he has 15 points in 32 games this year. The Tampa Bay Lightning announced they have recalled goaltender Louis Domingue from the Syracuse Crunch of the AHL. After stopping 26 of 28 saves for the Crunch Friday, the belief is that Domingue will share backup goaltending duties with veteran Peter Budaj, who only recently came back from injury. The belief was that Domingue, who has played eight games for the Lightning, has been stronger in goal than Budaj has been. Domingue has a 5-2-0 record with a 3.07 GAA and a .907 save percentage, while Budaj has a 3-3-1 record with a 3.76 GAA and a .876 save percentage in eight games. The transaction leaves Tampa Bay with just one final recall remaining for the rest of the season as this is the team’s third of four. The entire hockey world was watching last night as the league’s top two goal scoring talents went up against each other in the race for the Rocket Richard Trophy. Though Patrik Laine is quite the challenger, Alex Ovechkin showed once again why he is regarded as one of the greatest of all-time. Ovechkin scored two, including the 600th of his career, just the fourth player in history to do so in fewer than 1,000 games. As the league sends out congratulations to Ovechkin for his impressive accomplishment, they’ll continue to try and make minor tweaks to their roster to take him down once again in the postseason. We’ll keep track of all the minor transactions right here. The Buffalo Sabres have recalled Linus Ullmark from the minor leagues in time for today’s practice. Ullmark is the future in goal for the Sabres, as both Robin Lehner (RFA) and Chad Johnson (UFA) are free agents this summer. Lehner will bring quite an expensive price tag, and has struggled at times this season. The Toronto Maple Leafs have recalled Andreas Johnsson to the NHL for the first time in his career. The young forward has been the best player on the Toronto Marlies for most of the season, and has earned a taste of the next level after the Marlies clinched a playoff spot on the weekend. Calle Rosen has also been recalled under emergency conditions, meaning the sickness Nikita Zaitsev has been suffering from could be more serious than expected. The Philadelphia Flyers have assigned Anthony Stolarz to their ECHL team today, which could mean that the goaltender is ready to get into some games finally. Stolarz has been ravaged by injuries for the last year, but remains an interesting option for the Flyers going forward. His 6’6″ frame and relatively good performance at the AHL level shows some potential, but he’ll have to stay healthy and prove that he’s ready for a full workload. Interestingly, the Tampa Bay Lightning have assigned Louis Domingue to the minor leagues now that Peter Budaj is healthy enough to play again. Domingue played well in his short stint as the backup for Andrei Vasilevskiy, but will now wait in Syracuse for another opportunity. Ville Husso is on his way back down after backing up Jake Allen for the St. Louis Blues yesterday, meaning Carter Hutton is likely ready to return. The Blues play again on Thursday night against the Colorado Avalanche, in a very important game if they have any hope of making a charge at the playoffs. The Washington Capitals have decided that Madison Bowey is better off playing for the Hershey Bears than sitting in the press box, and have assigned the defenseman to the AHL. Bowey had been sitting out since the team acquired Michal Kempny and Jakub Jerabek at the deadline, and needs to get back into game action. The 22-year old looks like a big part of the future of the Washington blue line, and will likely be back up if they face any injuries down the stretch. Ryan Sproul is on his way up to the New York Rangers, as the team deals with an injury to Anthony DeAngelo and a setback in Kevin Shattenkirk’s recovery. Sproul has played just four games in the NHL this season, but once again has shown his offensive ability in the minor leagues with 29 points in 49 games. Evander Kane has found a new home, at least for the rest of this year. While it’s too early to know whether he will stay in San Jose for the foreseeable future, the Buffalo News’ Mike Harrington writes that the Sharks might be the best fit for the 26-year-old personality. In a 10-point notebook on Kane, Harrington writes that what Kane really needs is to be on a veteran team who will tell him how things work, something that he did not have in Buffalo. The Sharks, who are loaded in veterans such as Joe Thornton, Brent Burns, Joe Pavelski, Joel Ward and Marc-Edouard Vlasic, should be able to have some controlling effect on Kane. Thornton already proved that when the veteran picked Kane up from the airport in a limousine after the trade. He also writes that Kane already is showing off his speed with San Jose as he’s tallied up three assists in two games with the Sharks. That speed was not very apparent over the past couple of months in Buffalo, but the scribe writes that Kane was well aware Buffalo management wanted to move on from him and may have lost interest in sacrificing himself for the Sabres. Harrington also adds that general manager Jason Botterill should have made a trade earlier when Kane was hot. Knowing his reputation, which only got worse in the last couple of months with his teammates, they never were likely to get the asking price that Botterill was demanding. In the end, it was quite obvious that only veteran teams showed interest in Kane as the runner-up at the deadline was the Anaheim Ducks. Due to his reputation, Harrington wonders whether Kane will be forced to take a lesser deal this offseason. Players at his age and skill should be getting a long-term deals at $6-7MM, but Kane may be forced to accept something closer to a four-year term if teams continue to worry about his ability to co-exist with his teammates. Tampa Bay Times’ Joe Smith tweets that Tampa Bay Lightning backup goalie Peter Budaj, who hasn’t played since Dec. 29, is really close to returning to the team. The team could have a decision to make, however, as emergency backup Louis Domingue has won four of his six starts and has played well for Tampa Bay. Domingue, who has a 3.29 GAA and a .905 save percentage would have to be officially recalled, however, if they want to keep the 25-year-old. The team has already used two of their four allotted recalls on Anthony Cirelli and Adam Erne, so the team may not want to use a third recall yet and might stick with Budaj. The 35-year-old has struggled with Tampa Bay this year, however, with a 3.80 GAA and a .878 save percentage. John Boruk of NBC Sports Philadelphia writes that the Philadelphia Flyers talked to the Ottawa Senators right before the trade deadline about acquiring winger Mike Hoffman. The scribe writes that sources have said the Senators asked for a package that included defenseman Travis Sanheim and a first-round pick as a starting point. While a first-rounder (they have two of them this year) might have been a possibility, Sanheim proved to be the deal-breaker. Providence Journal’s Mark Divver tweets that he spoke to a pro scout who believes the Pittsburgh Penguins made a mistake when they traded enforcer Ryan Reaves to the Vegas Golden Knights last week. While Reaves took a lot of criticism for his lack of offense with the Penguins, he provided the team with leadership and a physicality the team really needed. The scribe writes that the Penguins struggled when things got tough Thursday when they played the Boston Bruins. In 2013, the Canadian Hockey League (CHL), the overarching body in major junior hockey that governs the Ontario Hockey League (OHL), Western Hockey League (WHL), and Quebec Major Junior Hockey League (QMJHL), decided to ban teams from drafting European goalies. The CHL holds an annual Import Draft in which all 60 teams across the three leagues are given two chances to draft foreign talent in an attempt to fill their two import slots on the roster for the following season. Sometimes the players who are drafted come over and other times they don’t. However, five years ago, CHL president David Branch and company decided to no longer take the risk of bringing in foreign keeper who could then in turn block young North American goalies by not allowing teams to select them in the import draft. While the idea was to protect the development and value of homegrown products, the result was a weaker product across the CHL and a more difficult time for their business partners in the NHL to evaluate foreign goalies. In fairness, the decision was made after a stretch of dominant play by European keepers at the major junior level. In 2010-11, the top save percentage in both the OHL and QMJHL belonged to imports: Petr Mrazek and Christopher Gibson. Not long before, Michal Neuvirth was one of the OHL’s best as well. In the mid-2000’s, Ondrej Pavelec controlled the QMJHL, leading the league in goals against average in back-to-back seasons among other accomplishments, and is arguably still the league’s best goaltender in history. This isn’t to say that Canadian and American goalies didn’t also flourish at that time as well, which calls the decision back into question. This was always a concern of quality over quantity, as the vast majority of teams still employed a North American starter and often a local backup or two as well. The CHL may have been concerned with the talent of some foreign prospects overshadowing Canada’s best, but they could never have honestly argued there was a lack of opportunity due to imported players. Top 2018 draft-eligible CHL prospects Andrei Svechnikov and Filip Zadina are both imports, yet they would never ban forwards. Nevertheless, the CHL made a decision which clearly hurt their own competition level by excluding some of the top junior-level goaltending talent in the world without any evidence that it was truly hurting their domestic counterparts. Now, years later, the league is rethinking that decision. John Matisz of the Toronto Sun reports that the league is considering lifting the ban on foreign goalies, and for good reason. The ban has simply made it harder for NHL team to evaluate European keepers – with foreign leagues often dominated by older, experienced players, while the top young skaters come overseas – but hasn’t stopped them from being drafted into the pros at the same rate as CHL goalies. Meanwhile, top prospects such as Ukko-Pekka Luukonen (Buffalo), Filip Gustavsson (Ottawa), and 2018-eligible Jakub Skarek still reside overseas, but could surely benefit nearly any team in the CHL. The major juniors face little risk that a reversal would harm them in any way. Interesting enough though, it may still be in European goalies’ best interests to remain in Europe and for NHL teams to focus on those who stay and face older, professional talent. The list of foreign goaltenders who played major junior in Canada and remain in the NHL – Mrazek, Neuvirth, Pavelec, Peter Budaj, Philipp Grubauer, Jaroslav Halak, Anton Khudobin, Marek Langhamer, Robin Lehner, and the most recent CHL import star, Oscar Dansk – all have one thing in common: they aren’t bona fide starters. Meanwhile, the likes of Sergei Bobrovsky, Henrik Lundqvist, Pekka Rinne, Tuukka Rask, and Andrei Vasilevskiy avoided North America until turning pro, and it worked out much better for them. With a new class of European goalies likely to join the CHL sooner rather than later, we’ll see if that trend continues. Although there aren’t any games on the schedule with the All-Star Skills Competition on tap tonight, there will still be some roster moves around the league as players get sent back to play while the NHL is off. We’ll keep tabs on those moves here. The Maple Leafs announced that they have returned winger Kasperi Kapanen to the AHL’s Toronto Marlies. His stint with the big club didn’t last very long as he was only recalled back on Tuesday although there is a good chance he’ll be recalled in advance of their next game on Wednesday. Kapanen has two goals in eight NHL games so far this season while adding 22 points (10-12-22) in 27 minor league contests, earning himself an All-Star nod at that level. However, despite being sent down today, Kapanen has been replaced by teammate Andreas Johnsson for the AHL All-Star Classic which takes place Sunday and Monday. Tampa Bay has flipped minor league goalies, recalling Connor Ingram from AHL Syracuse while sending Louis Domingue down, per the AHL’s Transactions page. The shuffle will allow Domingue to play a game to stay in game shape before they resume their schedule next week while Ingram’s addition keeps the Lightning at the minimum two goalies on their roster. After clearing waivers (per Sportsnet’s Chris Johnston on Twitter), the Blue Jackets have assigned winger Jordan Schroeder to Cleveland of the AHL, Aaron Portzline of The Athletic reports (Twitter link). It’s the second time that Schroeder has cleared waivers this season but since he has been up for more than a month under non-emergency conditions, he had to pass through once again. The 27-year-old has a goal and an assist in 21 games with Columbus this season while adding eight points (3-5-8) in 15 minor league appearances. Taking Schroeder’s place on the Columbus roster is defenseman Andre Benoit who has a goal and four assists with Cleveland in 31 games and last saw NHL action with St. Louis back in 2015-16. His recall is likely just to keep the team at the minimum 20 players on the roster.